We'll start off Sol 1957 with two ChemCam LIBS observations on the targets "South Harris" and "Drummock." We got our first taste of Drummock over the weekend with ChemCam and decided to analyze it again to better understand geochemical variations within the rocks around the rover. 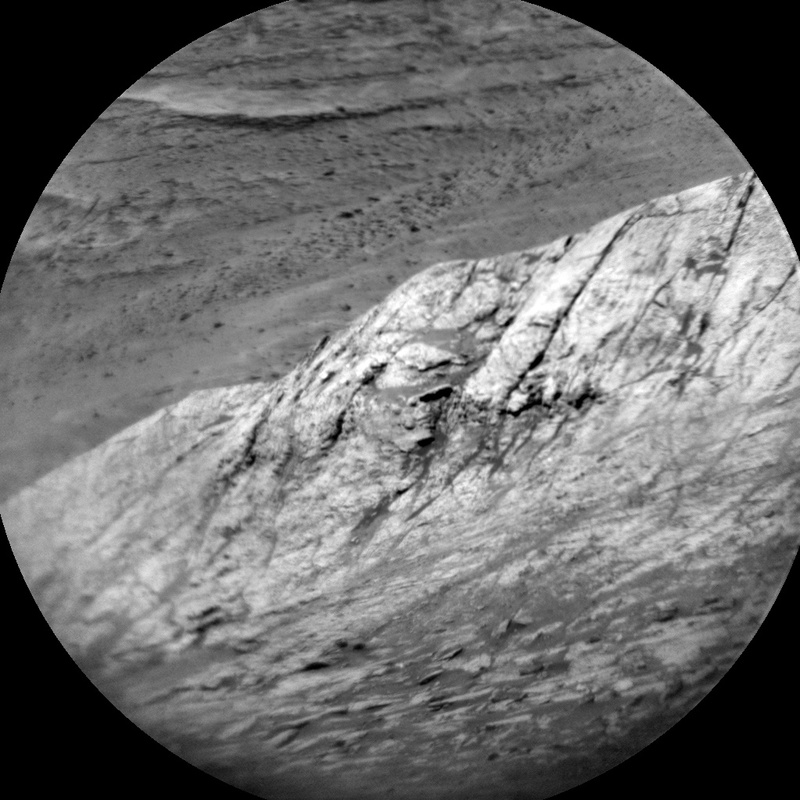 We'll take Mastcam images to document these ChemCam targets. We'll also take a Mastcam mosaic of "Bloodstone Hill," another target from the weekend plan that warranted further investigation - this area is featured in the black and white RMI image above. Another Mastcam observation in the plan is called a sky column, which we use to periodically monitor material around the Mastcam sunshade. Finally, we'll take a couple of Navcam movies to search for dust devils and cloud activity. In the afternoon of Sol 1957, we'll drive approximately 60 meters to put us in front of an area identified from orbit to contain an interesting gray patch of bedrock. Following the drive, we will take our standard post-drive images to set us up for remote and contact science on Wednesday. On the second sol, Sol 1958, our science activities are primarily dedicated to environmental observations. First, we'll use ChemCam to conduct a Passive Sky observation. Next, we'll use Mastcam to take a series of images that help us measure both the amount of dust and the optical depth of the atmosphere. We also have our standard REMS and DAN activities in the plan.